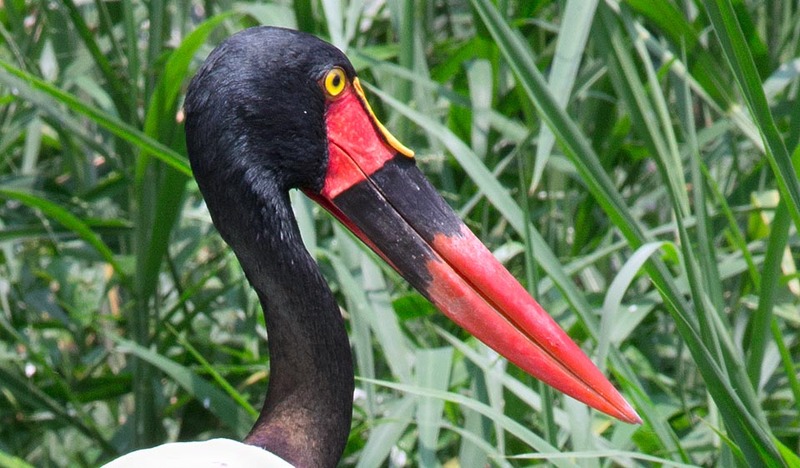 The African jabiru called also Saddle-billed stork or Saddlebill (Ephippiorhynchus senegalensis Shaw, 1800) belongs to the order of the Ciconiiformes and to the family of the Ciconiidae and is the African representative of the three species of this particular stork, present on our planet. The American species is however assigned to the genus Jabiru. Main characteristic of this bird is its showy bill on which are practically concentrated all its own marks and that render it particular and distinctive: the size, the colour, the shape and the beauty. Although of abnormal size even for a stork, family that usually is already endowed of a robust and well evident bill, this tool does not weigh that much its figure, on the contrary, helps to render it graceful and nice for the shape and even more for the colours that nature has used. We must not expect to see in the bill of this stork, the terrible and at times frightening rostra we find in the Shoe-billed stork (Balaeniceps rex) or in that of the Boat-billed heron (Cochlearius cochlearius) but by sure we are facing one of the most interesting bills of the winged world. Also its taxonomical classification resumes this feature, implicitly demonstrating that he who has studied and determined this species, has been, he too, immediately hit by this particularity. The etymology of the scientific name, for what concerns the genus Ephippiorhynchus, gets its origin from the Greek, with the combination of the two terms “ephippios” = saddle and “rhunkhos” = bill, rightly a bill shaped like a saddle and from the Latin the name of the species senegalensis = of Senegal, often maltreated epitet given to many birds that arrived from Africa or even generally from far away tropical zones not well defined. In Europe in the various languages they indulged in giving their own vulgar name to this nice stork, starting from the name Mycteria, term with Greek derivation from “mukter” = snout and “rhunkhos” = bill, meaning of upturned bill and Jabiru the local name in the Tupi language given by the Amazonian natives and then mainly used for identifying the American species (Jabiru mycteria). The three storks belonging to this group are often called major storks or great storks and live respectively in Africa, in Australasia and in South America. 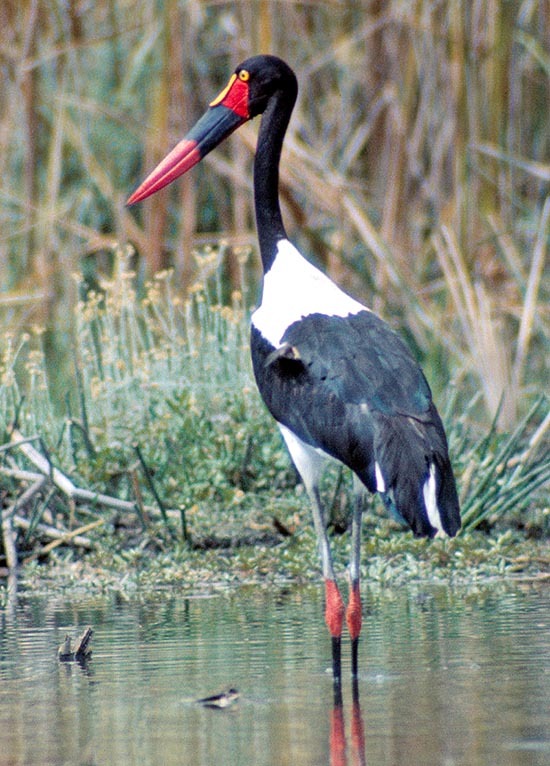 The saddle-billed stork is a uniquely African bird and occupies diffusely all the tropical sub-Saharan area of this continent, spacing from Senegal to Ethiopia and southwards up to South Africa. It is not a very common or visible in dense groups bird as it carries on a quite solitary life and almost always shared only with the partner even if mixed with other species but its diffusion is ample and the occupied territory is very vast. Like all Ciconiiforms this species is strictly linked to the aquatic habitat and sistematically avoids the dry or parched areas, seeking, during the alternation of the rainy seasons, the flooded and boggy sites. It is therefore considered as a sedentary species and subject only to seasonal and short errations. 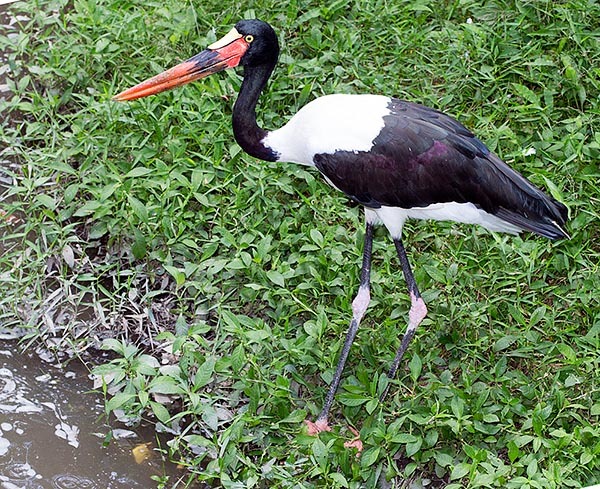 The Ephippiorhyncus asiaticus or Black-necked stork is the species typical of south-east Asia and the aforementioned Jabiru (Jabiru mycteria) the South American counterpart. This bird does not love the dense forests and much less the permanently arid zones but lives mainly in swampy marshes, banks of rivers and bends with slow flowing waters, lakes and water surfaces even of reduced dimensions. Usually it frequents open areas with great view but it is not rare to find them in small bushy and hidden water streams, where it spends its rather solitary life. It loves the quiet but does not fail to join other species of birds in places where the food is abundant but, as they say, stay far from the other birds often much more intrusive. 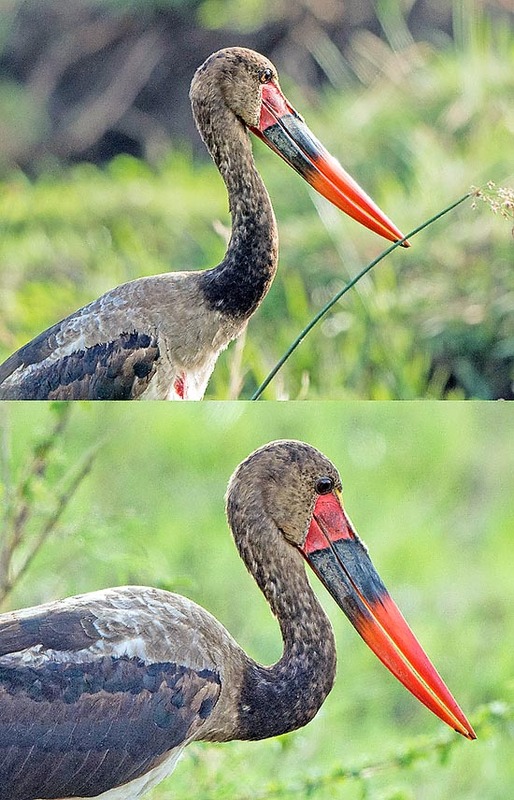 Contrary to all appearances, this stork is of sweet and friendly character and does not show any benefit due to its remarkable size, conversely, it is often disturbed and anticipated in catching the preys by other species in particular ardeids, notoriously more aggressive and invasive than our saddle-billed stork. The dimensions of the saddle-billed stork are considerable and in the areas where it lives is just surpassed only by the Marabou stork (Leptoptilos crumenifer) a ciconiid considered in its turn as one of the biggest flying birds. Its structure is however much more elegant, thin and elongated with tapered body well proportioned, a much elegant, almost royal gait, thin and long legs and much more coloured. It surpasses in length the 130 cm with a wingspan of 230 and a weight variable that may reach the 6 kg. Standing upright on its very long legs is more than 150 m tall. The basic colours of the livery are the white and the black. Neck and head totally black, chest and body candid white and alar cover again of raven black colour. With wings spread, it evidences from the upper side as well as from the lower, white remiges and black coverts, showing itself when flying as a bicoloured birfd. On the chest shows a small spot of bare skin of bright red colour tending to darken during the nidification. Characteristic of this stork is however the bill, practically a colourful palette of amazing colours, that march imaginatively. At the base is of vivid red colour, interrupted at about mid length by a wide black belt and then continuing again and up to the tip, with the same red of the initial part. On the face close to the attachment to the head, the bill is adorned by a shield (the saddle) of vivid yellow colour well visible even from far away and in sharp contrast with the other two colours. Such a coloured and massive bill exceeding the 30 cm of length, cannot by sure go unnoticed, especially in its pointed shape and gently bent upwards that renders it in the same time nice and kind. On the throat hang two small barbels, reduced ion the dimension but well evident, alos vivid yellow and easy to see due to the contrast with the underlying black. The colour of the eyes differs depending on the gender, being dark brown that of the males and brught yellow the females’ one. It is noted also a small difference in the size and in the weight in favour of the male. Very piercing eyes as also them in contrast with the raven black of the head. Also the legs do not lack of charm although being overall greyish blak but embellished by knees and feet of a nice pinkish colour. The tarsi are very long unlike the fingers that result small and quite undersized for its size. The young show right from the beginning the first traces of this livery but with colours and shades much less attenuated. Loke all storks, during the flight keeps the neck well stretched ahead with the bill slightly turned downward. As it has happened with many African birds with particular characteristics, see the African sacred ibis (Threskiornis aethiopicus), the Saker falcon (Falco cherrug), with the Pharaoh’s chicken (Neophron percnopterus), also this stork, in the old Egypt was part of the sacredness and was currently reported in their hieroglyphs. 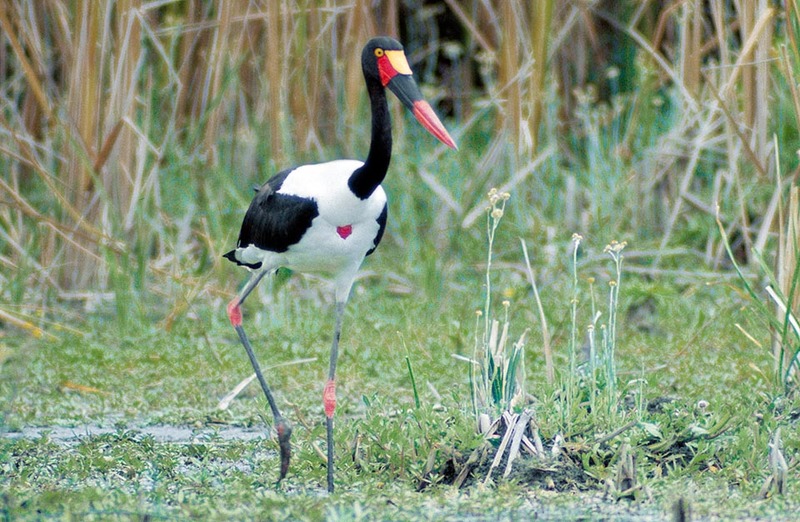 The saddle-billed stork is a monogamous species that lives in very close-knit couples maintaining during the reproductive period a spasmodic attention for the partner. Condition transmitted also to the progeny to which is dedicated a particular and careful attention. 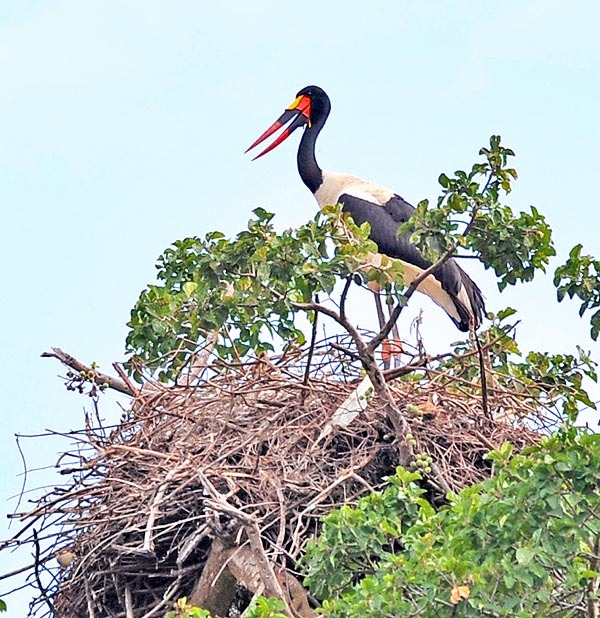 Actually, this stork lays a reduced number of eggs therefore it seems that the low number and the consequent and natural necessity of a good result in the reproduction is recompensed by a greater affect given during the growth. It is a quite silent species if not when in courting phase or, always from the nest, during the care of the chicks. Like all storks it practices the bill-clattering, the typical noise obtained by banging strongly and repeatedly the two mandibles but emits also low grunts when in couple. For nidifying it chooses bigh and high trees where accumulates a huge quantity of branches and twigs that then furnishes with softer material. It nidifies solitary and never in colonies not even mixed with other birds, only rarely two close nests may be observed. It is not constant and does not nidify all the years. The nest is often used for more years reaching increasing measures due to the continuous intake of new material. It lays 1 or 2 white eggs that are brooded by both partners, for about 7 weeks but usually are needed 10/13 more before the young leave finally the nest. They reach the sexual maturity by the third year and have a lifespan of twenty years. 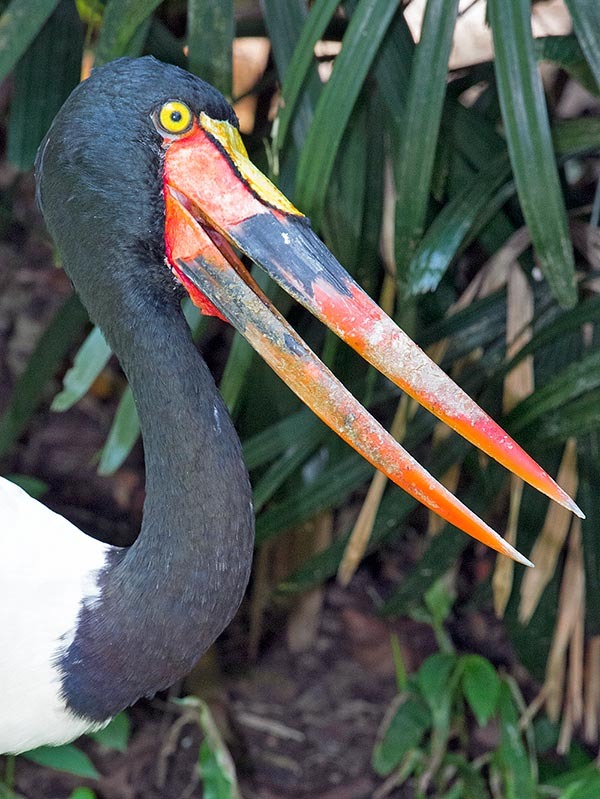 The saddle-billed stork nourishes mainly of fishes it catches immersing the enormous bill that closes suddenly as soon as the prey is met. Its diet includes usually crustaceans, amphibians, reptilians but also small mammals, birds and insects, locusts particularly. This stork lives well in captivity having a sweet and submissive character and so is present in quite many zoos all over the world. It is not considered as an endangered species.